Had a hankering to illustrate a VW bus so I just started utilizing shapes and the pen tool till I came out with something I liked. I was just messing around and trying to implement things that Julian taught before I thought of what movie poster this would be. 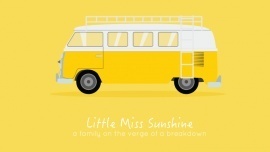 I decided to turn the bus yellow and it reminded me of the movie Little Miss Sunshine. I added the necesarry stuff and played with typefaces a bit. Still not sure if the yellow is too bright or not. Also want to add more details and subtle colors. I'd also like to give it some noise texture.